Right side of Old Fashioned Shell Hem Stitch. A hand stitched Shell Hem is a dainty and attractive finish for the edge of narrow hems, tucks and trims. 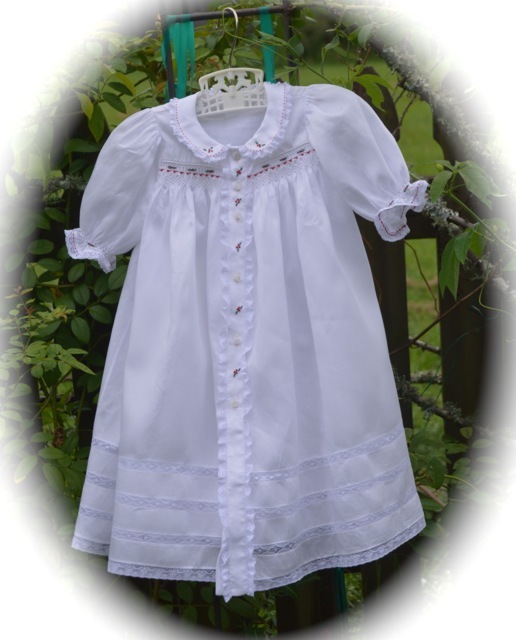 It has long been a favorite for baby clothes. The Shell Hem is an excellent choice for finishing the neck, armholes and hems of slips or nighties. You are actually hemming the fabric in a decorative manner. Fabric - The prettiest shell hem will be made when using lightweight fabrics that are 100% natural, such as cotton, silk and linen. 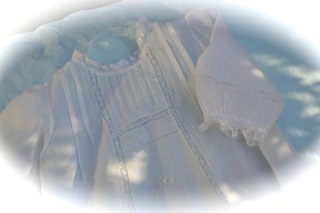 You can use poly/cotton with good results but the fabric has a tendency to pucker and the "shell" to roll over. 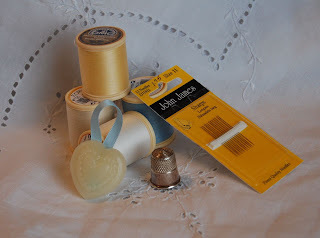 Notions used to stitch the Hand Shell Hem. Thread - Lightweight cotton. I use DMC #50 (you could also use silk). Use a single thread. Needles - Use a small needle. I use an #11 Sharps. I recommend using a thimble. Bees Wax - Coat your thread with Bee's Wax to help strengthen the thread and prevent tangles. 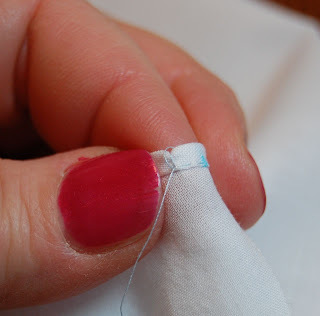 Use your thumb nail to finger press the fabric. Double fold the fabric for a total seam allowance of 1/4" (1/8" twice). Finger press in place by pinching fabric between finger and thumb nail. Shell stitches will be about 3/16" apart and will be worked from right to left. You can baste this hem in place if desired. 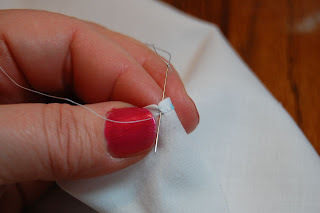 Begin the stitch by securing the knotted thread in the fabric fold. Take two tiny running stitches. 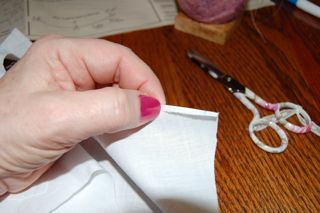 *Take two tiny Running Stitches along the bottom fold of the hem, through all thicknesses. This is the hemming part. The needle will come out where the indention of the shell will be. 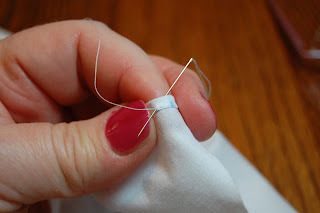 Toss the needle and thread over the hem to the right side of the fabric and bring the needle back through the fabric to the wrong side. The needle will come out where the thread from the running stitch is. Next, pull the thread snug to form the Shell. 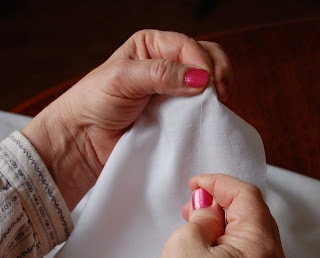 Hold the fabric that is forming the shell firmly between finger and thumb as the thread is pulled snug to complete the stitch. (This is very important! 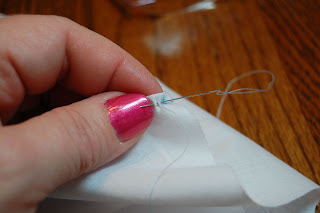 If you do not hold the fabric firmly either the fabric will pucker or you will be required to put so much tension on the thread to create the 'shell' that the thread easily breaks). Take another stitch, as before, in the same place. There will be two stitches, one on top of the other. 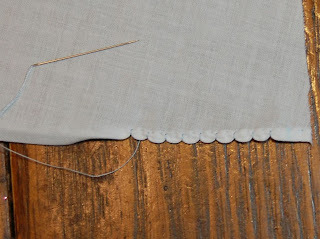 Toss needle and thread over the hem a second time, stitching in exactly the same place and pulling snug. The second stitch causes the shell to be more pronounced. Wrong side of fabric. 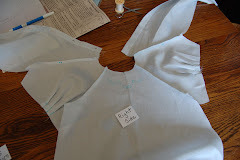 The blue mark on the right indicates where the seam allowance is on the garment. You will usually use a thread color to blend in with your fabric. The thread doesn't show, just the 'Shell'. 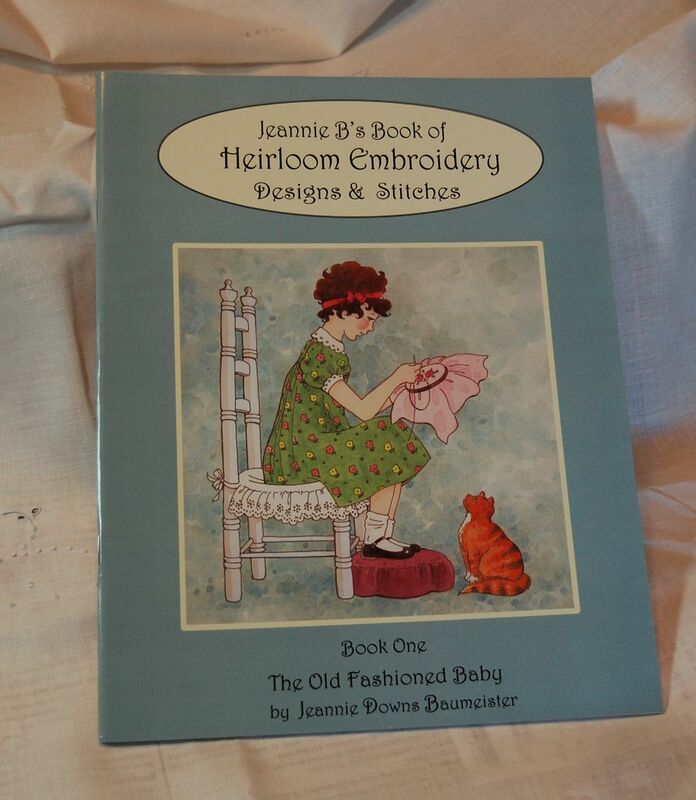 But it is fun to use a colored thread, perhaps to match your embroidery. 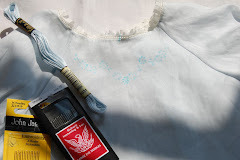 I am using a blue DMC thread on my slip. 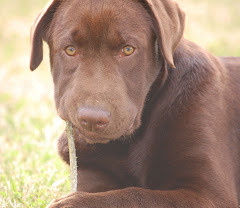 Don't make the mistake of using embroidery Floss. The Floss breaks too easily and the thickness of the Floss fills up the indentations of the shell. A bit of practice will make your stitches even and pretty. As a beginner, you can mark a dot every 3/16" as a guide. You can also put a large un threaded needle in your sewing machine, adjust the stitch length and 'stitch' to create even holes for a guide. 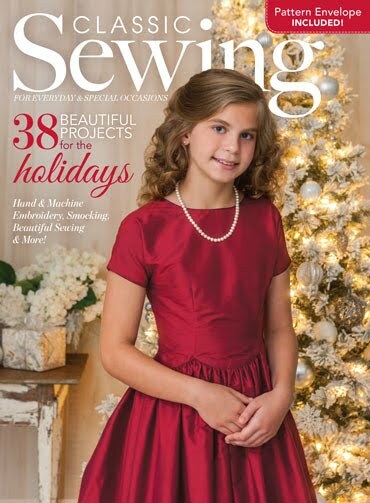 Your ultimate stitching goal is to obtain even stitches with out marking your fabric and it really is easy to do with a minimum of practice. This is a beautiful stitch. 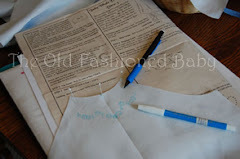 Excellent instructions - thanks "sew" much for sharing them! I LOVE the shell stitch! 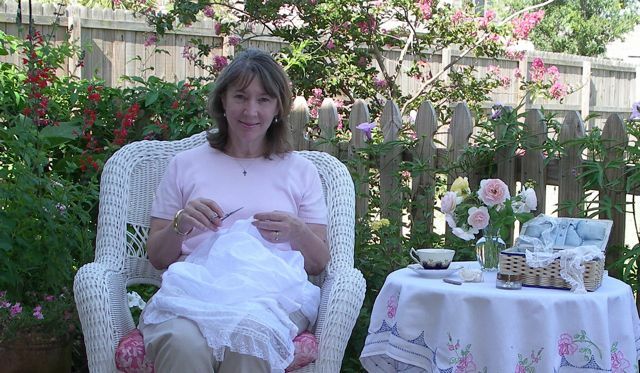 It was so great that you did this because I am making a square yoke dress by collars, etc., and could not do this stitche following their instructions. I was able to do this on the slip I made, and I was so happy! Thank you very much! 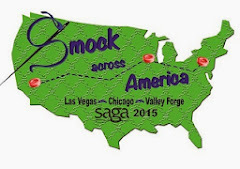 Does anyone have any suggestions for securing satin ribbon in lace insertion so that it does not pull out or twist? Or is that not a problem? 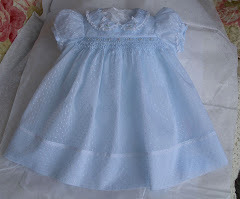 I am making a christening gown with very wide skirt. Thanks! 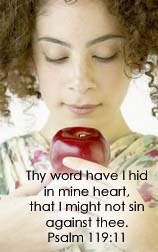 Your instructions are wonderful! Still have a problem when hemming across a french seam. The bulk prevents a pretty shell. Any suggestions? Thank you! 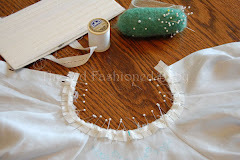 I looked at several tutorials on the shell hem but this one is the BEST by far! Thank you! I have read several tutorials but this one is the BEST by far! 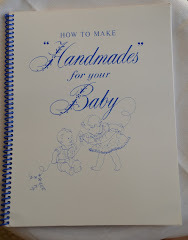 I'm using your instructions to trim a baby day gown. Very helpful!